Is your dog cute enough to serve with a scoop of ice cream? 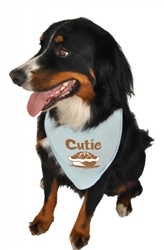 These 100% certified organic Turkish Cotton dog bandanas have a fashionable cover-stitch edge, rhinestone embellishment, and quality silk screened lettering. They are completely machine washable and prewashed to avoid shrinkage. Bandanas are hand screened in the USA with love. CutiePie-0001 Cutie Pie Bandanas - a) Small: L 21" W 12.5"
CutiePie-0002 Cutie Pie Bandanas - b) Medium: L 26" W 18"
CutiePie-0003 Cutie Pie Bandanas - c) Large: L 37" W 24"